The IEEE International Conference on Consumer Electronics (ICCE 2019) is the annual flagship conference of the IEEE Consumer Electronics (CE) Society. ICCE 2019, held in Las Vegas from the 11th till the 13th of January 2019, is the established forum for innovative research in all areas of consumer electronics and is co-located with the CTA’s Consumer Electronics Show (CES), which is the world’s largest consumer electronics trade-conference. - Audio, Video, and Cameras. - Entertainment, Gaming, and Virtual and Augmented Reality. - VR Display and Human Interface Technologies. - Machine learning, Deep learning and AI in Consumer Electronics. - Deep Learning & Perception on Conventional and Emerging Platforms. 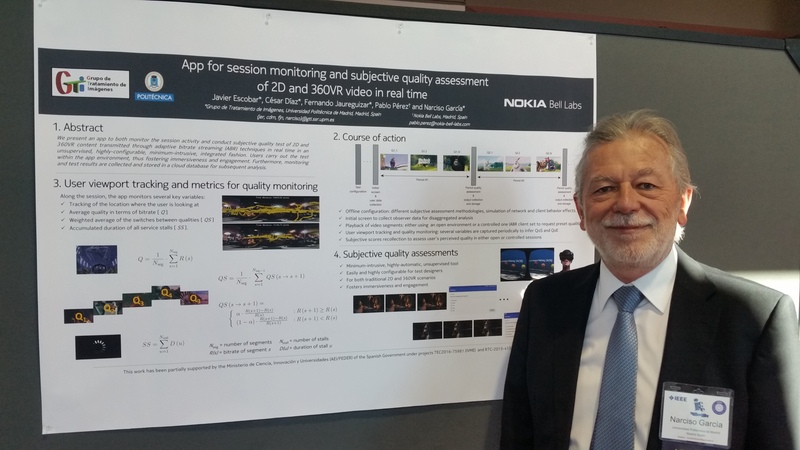 Among the techniques presented for immersive experiences, Narciso García, member of the Grupo de Tratamiento de Imágenes of the UPM, presented the contribution "App for session monitoring and subjective quality assessment of 2D and 360VR video in real time". This work presents an app to both monitor the session activity and conduct subjective quality tests of both 2D and 360VR content transmitted through adaptive bitrate streaming techniques in real time in an unsupervised, highly-configurable, minimum-intrusive, integrated fashion. Users carry out the tests within the app environment, thus fostering immersiveness and engagement. Furthermore, monitoring and test results are collected and stored in a cloud database for subsequent analysis. It has been done within projects IVME and MOVISE in collaboration with Nokia Bell Labs. The authors and affiliations are as follows: Javier Escobar, César Díaz, Fernando Jaureguizar, and Narciso García (Grupo de Tratamiento de Imágenes, ETSI Telecomunicación, Universidad Politécnica de Madrid), and Pablo Pérez (Nokia Bell Labs).